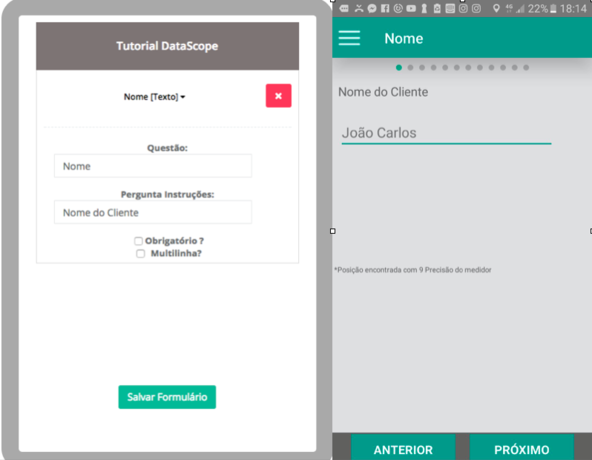 Step 1: How to create forms? To add a question select it from the available options, click and drag to the form. You can change the position of the question at any time. Just click and drag it to the desired position. It's what you want to get, how the question field on the form will be filled. The statement that appears in the app to whoever is responding to the form. When you want to get a word or text as a response. Only numbers can be used to answer this question. Only date and time can be selected to answer this question. Multiple question. You may choose only one option as an answer. As well as the List Option, multiple choice can select only one answer. However, this allows you to choose an existing list as the basis for the answers. It even allows you to answer the form to filter/find the answer you want by typing it. This option allows you to answer different multiple choice questions, with standard answers between them. Collects the signature of the desired person. Add a picture to the form. Additionally, you can disable the Device Gallery, so you can add new pictures directly from the camera of the device. Add a text / statement to the form, it will not go to filled form. Answer multiple questions from a list with numbers only. Answer several questions from a list. This type of question will allow you to manually input the identification number of the form. Obtain the barcode numbers directly from the camera of your device. Create sequences of questions that can be answered as many times as you want by clicking on the "+" button on the App by simply adding the questions inside the Sub Form. Note: Although in the example the questions of the Text and Date Time types were used, any type of question can be used within a subform.